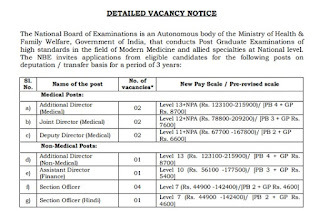 FDCM Forest Guard Recruitment 2019: Vanrakshak Bharti Application Form 2019 invites online mode. Eligible candidates register for 65 vacancies need to enrolled names by submit the forms as per the schedule & pay the application/examination fee. 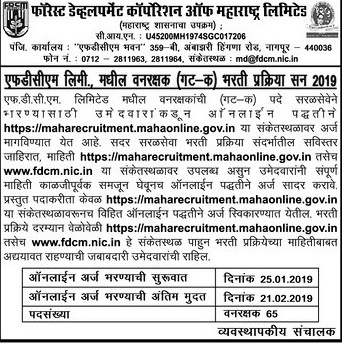 Maharashtra Water Conservation Officer Recruitment 2019 Notification | Maharashtra Water Conservation Officer Notification Recruitment Online Application Form. Soil & Water Conservation Department Maharashtra released notification to fill up the 282 vacancies. महाराष्ट्र वाटर कॉन्सर्व्हशन ऑफिसर ऑनलाईन अँप्लिकेशन फॉर्म्स submission starting date is 26th Dec 2018. Applicants check below given qualification details, If you have qualification details submit the application forms before the last date 15th Jan 2019.
www.esic.nic.in updated with ESIC Maharashtra Staff Nurse Recruitment 2019. 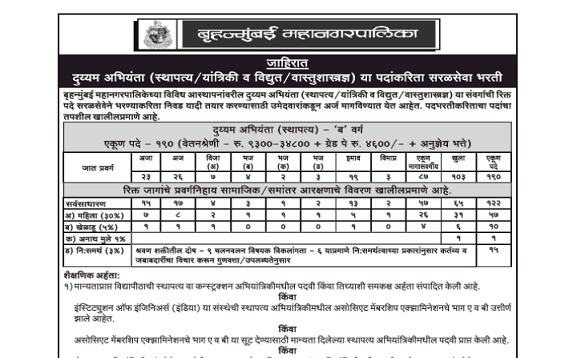 The candidates Download Employee's State Insurance Corporation Bharti Notification 2019 for Staff Nurse, Pharmacist, O.T Assistant from www.esicmaharashtra.gov.in, Check prospectus of vacancies. And fill the online application forms before 21.1.2019. 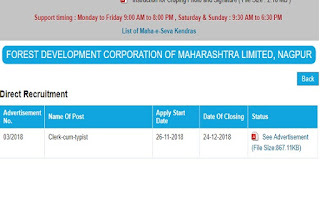 FDCM Clerk Typist Bharti 2018 Notification:- Forest Development Corporation of Maharashtra Limited invites Clerk Typist application forms to full fill the 66 seats at Maharashtra Forest Development Corporation. Interested candidates check FDCM Clerk Posts details & Fill online application forms. 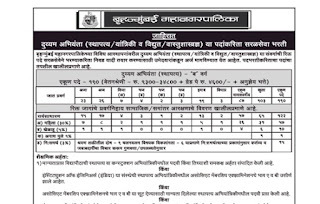 BMC Duyyam Abhiyanta Recruitment 2018 Notification Out. 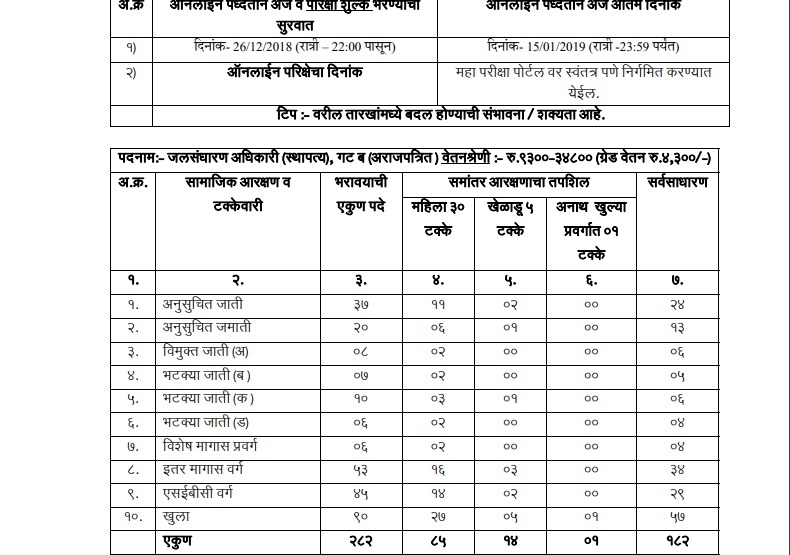 Brihanmumbai Mahanagarpalika Mumbai released the Secondary Engineers 291 vacancies notification. Apply for BMC Recruitment 2018 Mumbai submit the application forms in online mode. Online application process for Duyyam Abhiyanta posts starts from 17th November 2018. 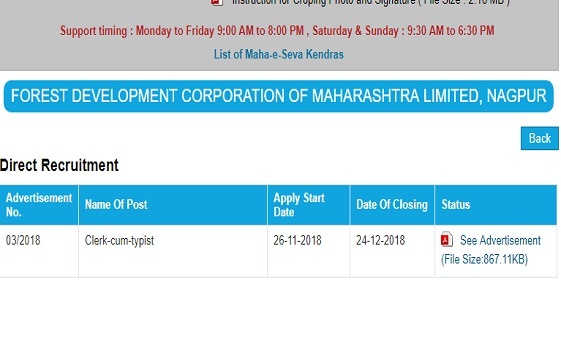 Interested candidates apply for Latest Maharashtra Jobs 2018 can submit the application forms before the last date. 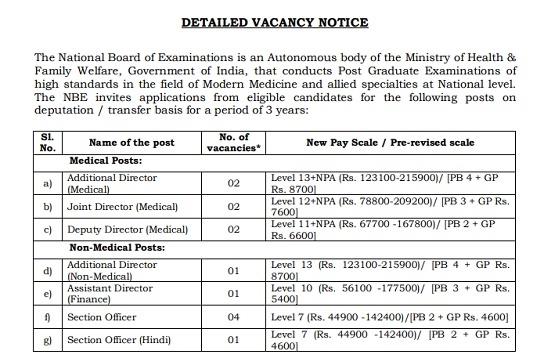 NBE Section Officer Recruitment 2018:- Apply National Board Of Examinations Medical/ Non-Medical Recruitment 2018 Notification Application Form released by Ministry of Health & Family Welfare, Government of India. Apply for NBE Recruitment 2018 Additional Director (Medical) and other vacancies check vacancy notice-NBE/Rectt./Dep/4-2018 & fill NBE Application Form which is available at www.natboard.edu.in. RRC WR Mumbai Grade C, D Recruitment 2018 Notification- Western Railway, Railway Recruitment Cell Mumbai released indicative notification recruitment against Souts & Guide Quota for the year 2018-19 at https://www/rrc.wr.com. Apply for RRC WR Level 1 & 2 Jobs 2018 opening date and time to submit online application forms is 21-11-2018 10.00 hrs to closing date and time 20-12-2018 22.00 hrs. 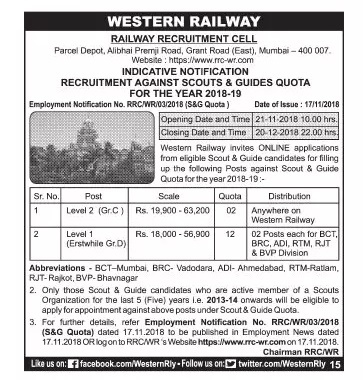 For complete details about RRC Western Railway Employment Notification No. RRC/WR/03/2018 (S&G Quota) candidates advised you visit official site.